Last week I told you about a line of paraben-free cosmetics called It Cosmetics. 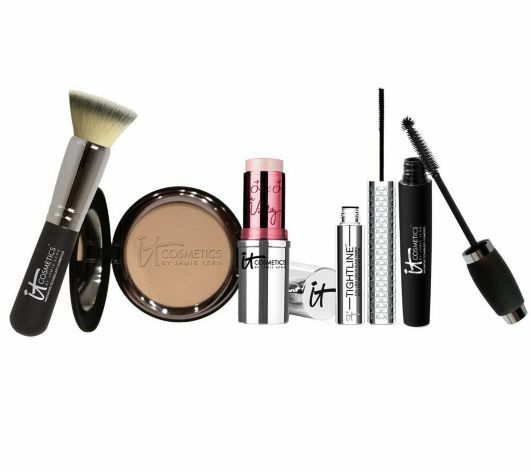 I am a huge fan of the Celebration Foundation and have now had a chance to try everything in their Hello, Beautiful Anti-Aging 5 Piece Color Collection, which is Today's Special Value on QVC right now. I am always skeptical about these color collections because you very often find that you can only use about half of the items. Not this collection! I am completely and madly in love with this foundation! I was sent Fair, which is very much like Creme from 100% Pure. It is perfect for right now, although in a few weeks it will be too light. Super pale girls like me will love it, as it is NOT pink. I hate fair shades that add pink to my already rosy cheeks. It is light though, so if you are between colors, go up a shade. Also, if you usually need a deeper shade in the spring/summer, go up darker than you think you will need. I love this. It reminds me very much of Vapour Organic Beauty's Aura Multi-Use Blush stick, but with a better texture and easier blendability. It looks colorless in the stick, but when you apply it to your cheeks (or lips), it adds a gentle hint of blush. It has a beautiful texture and it gives a subtle glow and color. You can use it to highlight, as a blush, and on the lips for a tint. This is a neat idea. My lashes are naturally long and dark, so to be honest with you I am finding that I do not need to use this. However, if you have skimpy lashes, you may find this to be beneficial. It does coat the lashes and is designed to work as a lash primer as well. I cannot say how this would work on someone else, but this is one of those products that I did not find to be of use for me. There are mixed reviews online of this mascara, so I wasn't expecting to love it. I do adore it, though! I like it even more than my beloved Jumbo Lash from Organic Wear. First of all, I love the handle! It has a special grip on it to allow you complete control. It isn't a thin applicator, so you really have control over the wand. Like I said earlier, my lashes are long. They are flimsy little things, though, with no volume. I do curl my lashes in the morning first (like I always do) and then I apply this mascara. I love it. Unlike others, it doesn't irritate my sensitive eyes. It never flakes, doesn't melt off, and contains so many great ingredients such as green tea, peptides, Vitamin A, C, E, and B5. I also love that the color is an ultra deep black shade. I kid you not--this is the BEST FOUNDATION BRUSH EVER. See all of the 5 star reviews on QVC here. I have used so many fabulous brushes over the years, from very affordable to super high end when I was working as a makeup artist. This is a TRULY luxurious brush. It sells for $48 in its own, but is included in this kit! It is cruelty-free and applies both pressed and loose powder foundations flawlessly. No shedding--this is fantabulous! 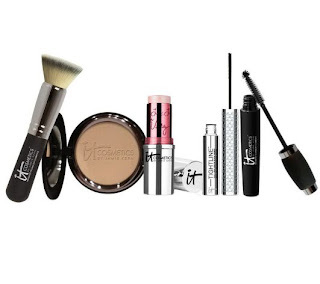 I absolutely love this collection and am really looking forward to trying more from It Cosmetics. In fact, I am going to order some items today, including the brow pencil that gets such raves. This collecion is a great deal at today's price of $54.96. You are getting 5 full-sized items and if you add up each product individually and were to buy them all that way, you would be spending more than that just for 2 products alone. I don't usually love these tv deals, but this is a great set of makeup! *Disclosure: I was sent the Hello, Beautiful kit for review consideration. This in no way has influenced the outcome of this review and all opinions, as always, are my own.